Beautiful! Which is your newest? Which is hardest to find? Orange is pretty rare feathered...fluorescent green (which i think is a variant of vaseline) is now safely known to be made by Christensen and Peltier is the newest. Rarest probably gray, not sure what else to call it...it's gray to the eye and backlights a very pale aqua. Given the range found elsewhere I suspect teal does exist but would also be quite rare. Others I'm not so sure, but Pelts have a wider range than thought. 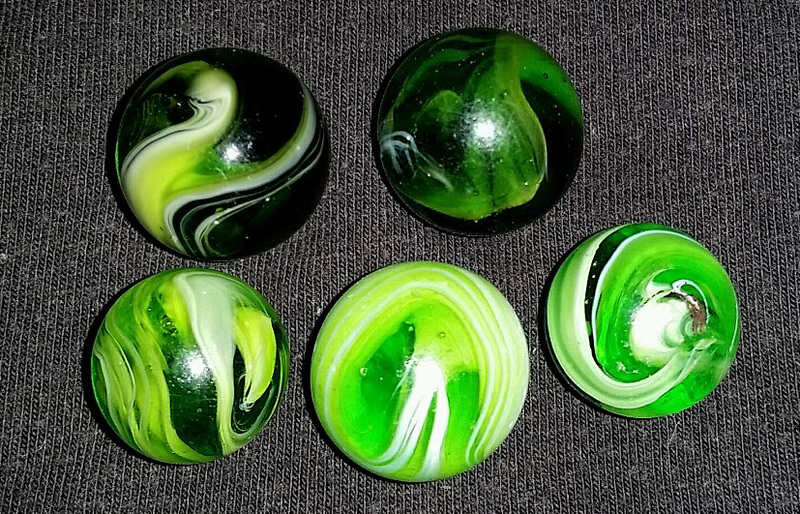 And now I'm curious, is that second marble in the top row of your photo a fluorescent green? In my photo below, it looks like the bottom three might be fluorescent green, but is it just because there is more white in mine? Curious, I have a few slags, but know very little about them.